One TGFM reader submitted this text conversation for us to analyze – let’s call him “Bob”. Bob met Angie at a bar where he got her number. This text conversation started a few hours following the number close. Bob does some things right and some things wrong, let’s take a look. Bob initiates the conversation with “Angie!”, the girl’s name. Bob correctly messages her the same night of the number close. You should text her a few hours following a number close in order to get your number in her phone while her memory of you is still fresh and emotional. Bob shouldn’t have appended a “!” to her name – exclamation points always make your texts sound less powerful. Bob could’ve also done better than to write her name. He could’ve made a small reference to something they talked about so she’d remember him better. For instance, he could’ve texted something related to the dog story or just his name “Bob”. In Bob’s next line, he starts by answering her question with his name. Bob was right to give his name out, but he should’ve acknowledged her slight faux pas for forgetting his name. He should’ve also shown reluctance to give out his name because he remembered hers and she didn’t his, which is evidence he’s lower status. Texting “Goldfish memory? It’s Bob” would’ve done the job. In the second half of Bob’s text, he wrote “remember I told you about my dog?”. It’s good Bob is bringing up a topic they’ve discussed before, but his execution could’ve improved. 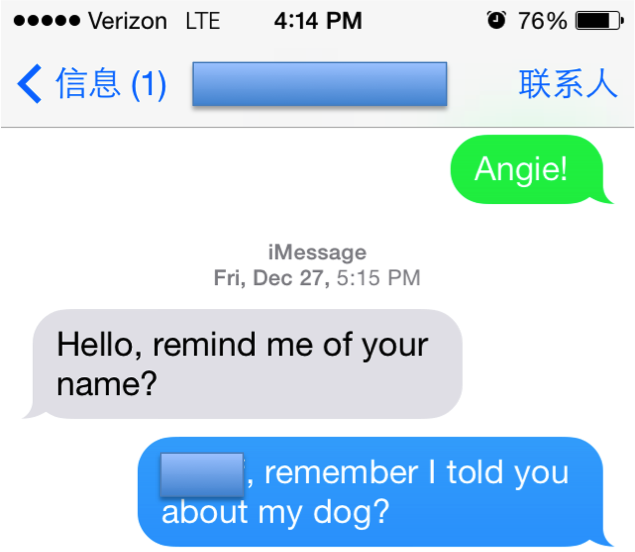 He could’ve sounded less reactive by atomizing his text to something like “remember dog story?”.